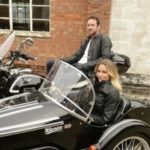 The following sidecar info may be helpful to anyone considering buying an outfit. The rules covering motorcycle licences in the UK (and Europe) changed on 19 January 2013. As we understand the situation, you need a full (Category A) motorcycle licence in order to ride a motorcycle & sidecar combination. If you pass your test in a motorcycle with sidecar your licence will only be for motorcycles with sidecars. For more information visit The motorcycle practical riding test. According to the BMF (British Motorcyclists Federation) helmets are compulsory and must be marked BS 6658 1985 or UN/ECE 22-05. A sidecar driver and pillion passenger must wear a helmet but sidecar passengers do not require a helmet. 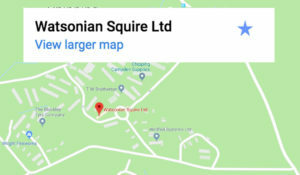 At Watsonian Squire we strongly recommend that all passengers travelling in a sidecar always wear a road legal motorcycle helmet. 1. Get some expert tuition in a wide open space away from traffic & obstacles, where you can get accustomed to the handling, which is very different to a solo motorcycle. 2. Think about road position – you need to ‘drive’ an outfit as if it is a car, allowing plenty of space for the sidecar next to you. 3. Corner entry speed is the key to confident sidecar driving and enjoyment! Sidecars behave differently on left & right hand bends, so you need to start slowly until you have got a feel for how they corner. You’d be amazed how quickly & cleanly a skilled sidecar pilot can take a corner. 4. Remember to STEER not lean! 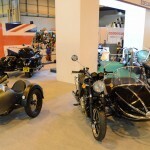 fit the sidecar on the left-hand side of your motorbike if it was registered on or after 1 August 1981. You’ll need to use a different riding technique when you have a sidecar attached to your motorbike. 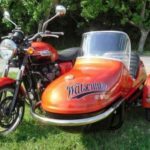 The sidecar will affect the braking, steering and overall dynamics of the machine. When you’re turning, you’ll have to steer using the handlebars because you can’t lean the machine over. 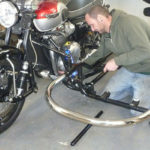 On left-hand bends, the sidecar wheel will tend to lift as the weight is thrown outwards: take care to keep the wheel on the ground. The extra weight of the sidecar will increase your machine’s stopping distance so brake earlier. The sidecar will tend to pull to the right when you’re braking heavily unless it has its own brake. 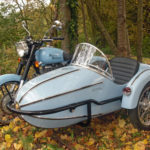 Most motorbikes used in sidecar combinations are specially adapted for this purpose – for example, the suspension settings or tyres may be changed. If you want to ride the motorbike without the sidecar, it’s likely to need changing again so it’s suitable to ride on its own.